The golf course is built into the natural landscape of a boreal forest point of land that protrudes into the waters of North Wabasca Lake. Corridors of tall trees have been cleared and replaced with undulating grass fairways. Amazing Bentgrass greens were grown and are surrounded with molded swales and mounds. White silica sand bunkers and four sets of tee decks have transformed this forested land into a must play golf course for any level of golfer. The scenery is breathtaking with majestic tall trees and views of the lake with an occasional sighting of an eagle flying overhead. 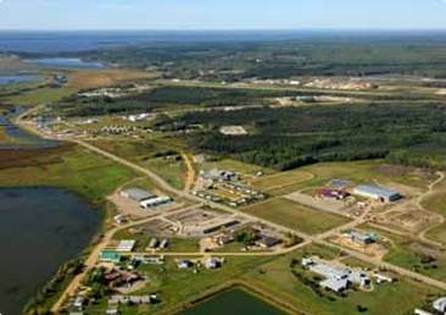 The community of Wabasca is a peaceful First Nations area comprised of Cree (Bigstone Band) and Métis. Recent development in the oil field industry and natural resources sector has led to rapid growth with many trade workers in the area. Wabasca is located approximately three and a half hours north of Edmonton. The Wabasca River is a tributary of the Peace River in Northern Alberta and it originates from Sandy Lake to the south east and flows west to the South Wabasca Lake to North Wabasca Lake. Wabasca offers many recreational opportunities for the adventurous traveller with excellent fishing and hunting, off-roading and campgrounds with pristine beaches. There are a variety of standard and upscale accommodations in the Wabasca area including camping facilities, hotels, and open camps.